I’m stuck. I don’t know what to write. But really, this place certainly deserves a spot on CTMQ as it is very, very unique and “curious.” As I am not Catholic, nor was I ever Catholic, I cannot speak upon the various saints and icons and all that stuff. I did have Rob C with me, however, who knows a Papal thing or two. 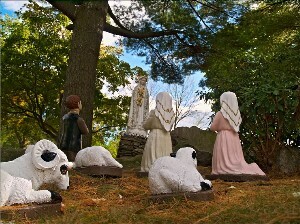 All I can tell you is that someone with a lot of faith and free time went nuts at St. Margaret’s Chapel in a surprisingly suburban section of Bridgeport. Fortunately, we have the Internet these days, to assist your author with such explanatory endeavors. So, Internet, how did this place come about? “St. Margaret’s Chapel was built in the year 1942. The world was at war – men, women and children were dying – how does a community honor those people who lose their lives during such treacherous times? One community in suburban Bridgeport CT planned and erected the above St. Margaret’s Chapel and Shrine partly for this purpose, it would be a Monument to Peace built in memory of those who had lost their lives. The people, who were of Catholic faith, chose the name St. Margaret after the shepherdess who is the patron saint of pregnant women and working girls. Wait – patron saint of working girls? I’m confused by that, but I’ll let it go. The site I got that from has a rather unique little Quicktime movie of the chapel inside – which you should check out – if only because that 360 degree “picture” was done by piecing together multiple still camera shots. And it looks pretty cool. Oh there’s more! A maudlin YouTube video of the place set to Tom Waits’ “Georgia Lee.” If that one was too slow, this one is a bit more upbeat (with more irony and imagery than I could even piece together) set to Waits’ wonderful Chocolate Jesus. Both pretty much tell the whole story of this haunting and surreal place. 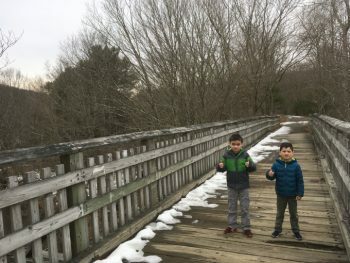 Like Waterbury’s singular Holy Land (CTMQ Visit here! 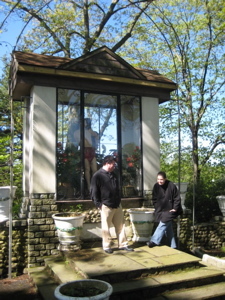 ), this shrine was really quite a site at one time. But now it is run down and kitschy and weird. There are paths up hills to nowhere and little buildings with nothing in them anymore. 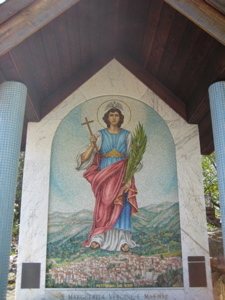 There are copies of statues in grottos containing mosaics, and replicas of famous pieces like Michaelangelos’ Pieta. I don’t have much more except that I’m glad I stopped by here on my day long Bridgeport-Milford CTMQ day. 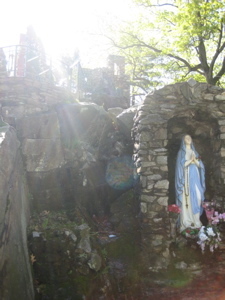 Next time I run into a working girl, I’ll let her know I said a prayer for her over at her Patron Saint’s shrine. Oh yeah… and apparently people get married here. That’s just gross. What’s with the shirt and tie? The place was pretty freaky. I don’t care if you are the most Catholic Catholic in all of Catholicism, to have your wedding pictures taken here is weird and, dare I say, a bit tacky. I remember visiting this site over 15 years ago when my husband and I lived in Bridgeport. We saw it lit up at night and draped with holiday lights for the Christmas season. I noticed the “JesusLand” YouTube montage had a photo of a “no trespassing after dark” sign. Is it possible to visit at night, for the maximum surreal effect? I dare you to mock this religious site during the Feast of St Anthony. 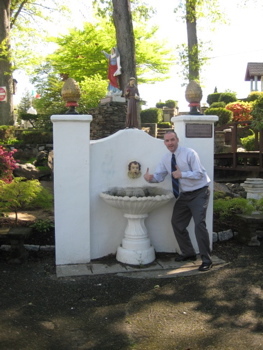 I double dare you to travel down to the Lourdes of the Bronx, St Lucy Grotto and mock that site during holy week…. And not hiding behind a computer screen- coward. In person, verbally to the worshipers. If you haven’t noticed, all “religions” have weird customs and curiosities. You really seem to be focused on Christianity. On the band wagon. Your kind, who think you are oh so liberal and open minded with your sarcastic digs, are just further dividing people. The only way people will ever come together is when respect is accomplished. Unfortunately, I feel it is a lost cause. As I mentioned in a previous comment, I look forward to your “so called witty” observations of other religious sites.